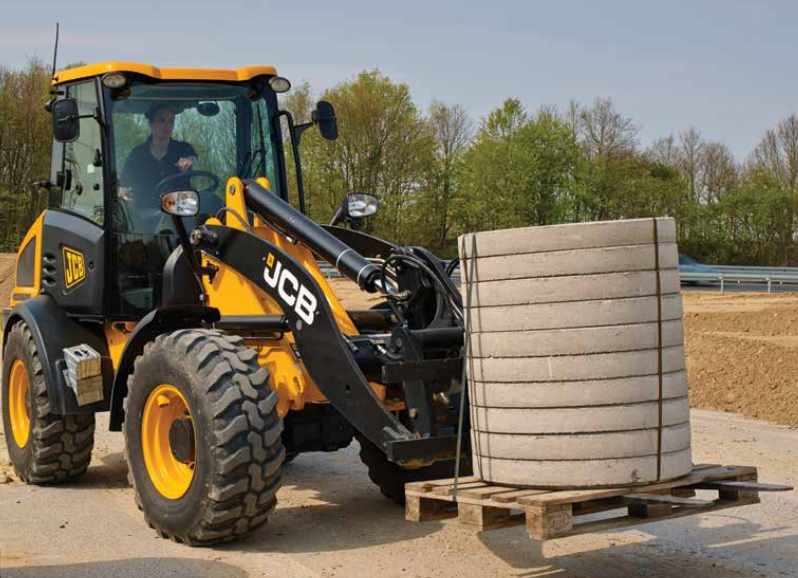 JCB and Kohler have produced the ultimate compact wheel loader engine for the 407. It’s Tier 4F-compliant using only a DOC, while low-rev power and torque means good fuel economy. Dimensions are compact for small turning circles. The 407 loading shovel has a new high speed option – this provides a 25mph top speed. Power is transferred to the ground efficiently through an innovative chassis, with perfect harmony between all components. With our High Flow option, the JCB 407 compact wheel loader enjoys an extra 8 gallons of hydraulic capacity for an enhanced flow rate. Equip your wheel loader with our new towing option and you’ll get a tow bar with rear electrics and hydraulics, allowing you to trailer loads of up to 7716lbs or carry rear attachments like salt spreaders. We use state-of-the-art manufacturing processes, finite element analysis and extensive rig testing to achieve the very highest levels of quality. Cold cell testing guarantees starting performance at temperatures as low as -4 F.
Most T4F engines use a Diesel Particulate Filter (DPF). The new Kohler engine designed by JCB doesn’t, thus reducing service and running costs. Its EcoMAX engine means this loading shovel meets Tier 4i/Stage 3B emissions legislation without exhaust after-treatment, while its spacious cab has enough comfort to meet the demands of any operator. It’s also an extremely safe machine that can maximize uptime with its easy servicing and low maintenance requirements. The Tier 4i EcoMAX engine in the JCB 411 loading shovel uses less fuel than our Tier 3 engines, saving you money. What’s more, it doesn’t use exhaust after-treatment, meaning there’s no need for costly heat-resistant lube oils. High back-off brakes reduce viscous drag during roading and rehandling, which boosts fuel efficiency on your loading shovel. The JCB 411 wheel loader’s viscous coupled engine fan automatically adjusts its speed depending on ambient temperature, optimising cooling, saving fuel and lowering noise. Our regenerative dump circuit improves cycle times on this wheel loader; it also improves economy by reducing hydraulic power consumption. Not only that but the adjustable proportional auxiliary flow rate makes using specialist attachments easy. The JCB 411 loading shovel can be specified for heavy-duty applications like waste or corrosive material handling. Auxiliary flow rate is also fully adjustable on the move for precision attachment control; you can even select constant flow for rotary attachments. JCB’s award-winning EcoMAX 4.4-litre engine delivers 81 kW (108 hp) and 516 Nm in this wheel loader; a variable geometry turbo offers increased performance at low engine speeds for improved cycle times and tractive effort. With a choice of axle options you can tailor your JCB 411 to any application. Open differentials are ideal for hard standing ground conditions, while a limited slip differential is perfect for soft, muddy terrain with reduced traction. The JCB 411 loading shovel’s powerful twin hydraulic gear pumps circulate 123 l/min for fast cycle times; so that you can perform parallel lifting and use plenty of attachments, there’s a high torque (HT) loader arm fitted too. We’ve made sure that forward visibility on the JCB 411 is excellent, while our optional quickhitch makes attachment changing easy and efficient (even with aftermarket attachments). To prove how good our EcoMax engines are, we’ve tested them for 110,000 hours in 70 different machines – including loading shovels – across the toughest applications and environments. Finite element analysis and rig testing ensure superior structural strength and durability, while robot machining, precision paint technology and innovative assembly techniques achieve the very highest levels of quality. Cold cell testing guarantees starting performance down to -20ºC. To protect the bonnet, recessed rear lights and cooling pack of this wheel loader from impact damage, we’ve fitted a full-width rear counterweight. The hydraulic tank and fuel tank on a JCB 411 wheel loader are both integral to the chassis, providing protection as well as structural strength. Precision machining provides high tolerances and accurate location of pins and bushes; the articulation joint has a heavy-duty center pin and oversized bush, as well as twin taper roller bearings, which can tolerate both vertical and horizontal loadings. The JCB 411 loading shovel’s tilting and telescopic steering column is easily adjusted. Operators can also choose their perfect control system: multi-lever, joystick and separate auxiliary lever, or our new joystick and electro-hydraulic proportional auxiliary control. A stylish, modern central dash display on this loading shovel combines analogue dials and a color LCD screen displaying machine health details, service requirements, operating information and more. JCB Smoothride load suspension limits shock loadings on the 411 wheel loader, and therefore reduces material spillage and structural stress, as well as increasing operator comfort. A 3-piece laminated front screen provides excellent visibility while interior mirrors, heated exterior mirrors, an optional reverse camera and a sloping rear bonnet give good rearward views. The 411 loading shovel offers uncompromised visibility; our EcoMAX engine doesn’t require bulky exhaust after-treatment, so it’s extremely compact, housed beneath a sloping rear bonnet with the exhaust silencer and air intake filter both out of sight. The cab on this wheel loader is isolator-mounted, compliant with ROPS/FOPS standards, and positively pressurised against dust. You can choose from fresh air, carbon and P3 – HEPA recirculation filters as well. The JCB 411 loading shovel has interior mirrors, heated exterior mirrors and hood mirrors for superb all round visibility. Our optional rear camera displays an unobstructed rearwards view on an in-cab color monitor. Regardless of which wheels and tyres you use on your loading shovel, both the front and rear of your machine will be protected by full bumpers that are integrated into the strong chassis. Quick, easy access to the engine bay and cooling pack are ensured with the 411 loading shovel’s large single piece bonnet. Ground level daily check and grease point access makes life even easier and safer. Because EcoMAX uses innovative JCB Clean Burn Technology, it’s Tier 4i/Stage 3B compliant without needing after-treatments like DPF or SCR. In turn, that means there’s no need for additional AdBlue fluid level maintenance, reducing servicing and running costs. The electronic monitoring system relays machine condition in real time alerts, safeguarding both the JCB 411 wheel loader and its operator. With the optional auto lubrication kit, your loading shovel will take care of its own greasing requirements. Full hydraulic dual circuit braking with multiple oil-immersed discs gives the 411 wheel loader’s braking system a virtually maintenance-free lifespan. The Tier 4i EcoMAX engine in the JCB 417 loading shovel uses less fuel than our Tier 3 engines, saving you money. What’s more, it doesn’t use exhaust after-treatment, meaning there’s no need for costly heat-resistant lube oils. The variable displacement pumps on the 417 feed a load-sensing valve block which only consumes power on demand, providing precise, efficient loader control. The JCB 417 wheel loader’s viscous coupled engine fan automatically adjusts its speed depending on ambient temperature, optimising cooling, saving fuel and lowering noise. The JCB 417 loading shovel can be specified for heavy-duty applications like waste or corrosive material handling. Auxiliary flow rate is also fully adjustable on the move for precision attachment control; you can even select constant flow for rotary attachments. JCB’s award-winning EcoMAX 4.4-litre engine delivers 93 kW (125 hp) and 550 Nm in this wheel loader; a variable geometry turbo offers increased performance at low engine speeds for improved cycle times and tractive effort. The JCB 417 loading shovel’s variable displacement piston pump delivers a 156 l/min flow rate for ultimate multitasking. 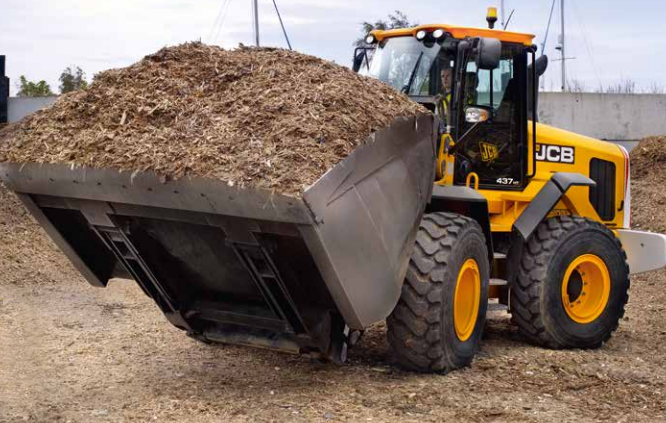 So that you can perform parallel lifting and use plenty of attachments, there’s a high torque (HT) loader arm fitted to this wheel loader, with the option of a Super HT arm for high-up applications like hopper and lorry loading. We’ve made sure that forward visibility on the JCB 417 is excellent, while our optional quickhitch makes attachment changing easy and efficient (even with aftermarket attachments). The hydraulic tank and fuel tank on a JCB 417 wheel loader are both integral to the chassis, providing protection as well as structural strength. Precision machining provides high tolerances and accurate location of pins and bushes; the articulation joint has a heavy-duty centre pin and oversized bush, as well as twin taper roller bearings, which can tolerate both vertical and horizontal loadings. The JCB 417 loading shovel’s tilting and telescopic steering column is easily adjusted. Operators can also choose their perfect control system: multi-lever, joystick and separate auxiliary lever, or our new joystick and electro-hydraulic proportional auxiliary control. A stylish, modern central dash display on this loading shovel combines analogue dials and a colour LCD screen displaying machine health details, service requirements, operating information and more. JCB Smoothride load suspension limits shock loadings on the 417 wheel loader, and therefore reduces material spillage and structural stress, as well as increasing operator comfort. The 417 loading shovel offers uncompromised visibility; our EcoMAX engine doesn’t require bulky exhaust after-treatment, so it’s extremely compact, housed beneath a sloping rear bonnet with the exhaust silencer and air intake filter both out of sight. The JCB 417 loading shovel has interior mirrors, heated exterior mirrors and bonnet mirrors for superb all round visibility. Our optional rear camera displays an unobstructed rearwards view on an in-cab colour monitor. Quick, easy access to the engine bay and cooling pack are ensured with the 417 loading shovel’s large single piece bonnet. Ground level daily check and grease point access makes life even easier and safer. Full hydraulic dual circuit braking with multiple oil-immersed discs gives the 417 wheel loader’s braking system a virtually maintenance-free lifespan. The JCB 427’s T4i compliant Cummins QSB 408 in3 engine produces its power and torque – 158hp and 7,089lbf respectively – at low revs for excellent response and optimum efficiency. For easier maintenance, this engine doesn’t require DPF aftertreatment. A variable geometry turbocharger means the 427 enjoys increased performance at low engine speed for improved cycle times and tractive effort. Compatible with a raft of aftermarket attachments, JCB’s optional quickhitch makes changeovers swift and efficient. There’s also an extensive range of axle options so you can tailor a JCB 427 to any application. Powerful twin variable displacement piston pump hydraulics help the 427 to circulate a massive 264 l/min for fast cycle times and excellent multifunction capability. 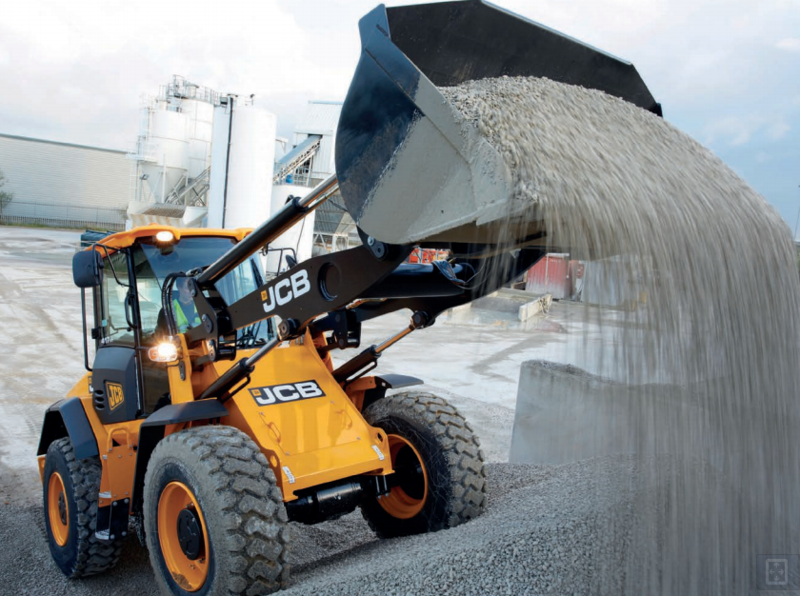 Choose the perfect JCB 427 loader arm for your application: Z-bar linkage (ZX) for high breakout applications; High Torque (HT) for parallel lift and multi-attachment use; or HT High Lift for higher loading applications. 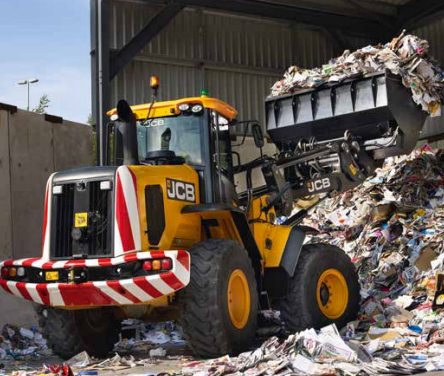 JCB’s innovative electronic management can perform progressive clutch cut-off for efficient, productive loader control. The 5-speed transmission option with torque convertor lock-up, meanwhile, provides better acceleration, hill climbing and roading performance. The articulation joint on a JCB 427 has a heavy-duty box section – stronger than a single plate with boss. For added protection, the 427’s steering rams are high up, and its hoses are routed neatly through the articulation joint. There’s a heavy-duty centre pin and oversized bush on the JCB 427’s articulation joint for even more durability, as well as twin taper roller bearings that can tolerate both vertical and horizontal loadings. The rear counterweight and cast quarter pillars protect the 427’s cooling pack and the back end of the machine from damage. There’s a stylish, modern central dash display which provides machine health details, service requirements, operating information and more. The 427 has air conditioning and automatic climate control options to create perfect working temperatures– as well as a range of seat options.. The selectable loader arm detents mean operators can set loader arm height limitations, return to dig and float functions for improved safety and productivity. A 3-piece laminated front windshield, interior mirrors, heated exterior mirrors, an optional reverse camera and a sloping rear bonnet give the JCB 427 excellent all-round visibility. The optional rear-view camera displays an unobstructed rear view on the JCB 427’s in-cab colour monitor. The JCB 427 has superb all-round visibility, courtesy of interior mirrors, heated exterior mirrors and bonnet mirrors. Non-slip walkways and additional grab handle options make operators safe climbing onto the JCB 427. The JCB 427’s Automatic Idle feature returns the engine to 700rpm after 30 seconds of inactivity, while Eco mode limits engine speed to 1800rpm for reduced fuel consumption. Either way, productivity remains formidable. Wheel speed braking means the 427’s brakes rotate at the same speed as the wheels for heat and drag reduction, as well as improved fuel economy. The JCB 427 Agri model boasts an optional 6-speed gearbox for optimum gear-matching to any application; this option also comes with a torque lock-up between gears 2 and 6. The JCB 427’s hydraulic cooling fan automatically reacts to ambient temperature and adjusts the fan speed to optimise cooling, reduce fuel consumption and lower noise levels. Unloaded spool valves in the valve block mean that arms lower under gravitational, not hydraulic force, reducing fuel consumption. Gain easy access to the JCB 427’s engine bay and large single-faced cooling pack with wide-opening gullwing doors. Daily checks and grease points can be accessed from ground level. An electronic monitoring system relays machine condition, giving real time alerts. This safeguards both machine and operator. Full hydraulic dual circuit braking with multiple oil-immersed disks gives the 427’s braking system a virtually maintenance-free lifespan. The JCB 437 is designed to maximize efficiency and, with it, productivity. As such, it’ll save you time, money and a whole lot more. Built using the finest components – a Cummins engine, ZF transmissions and axles, and Rexroth pumps – the 437 will last the distance. And, with 173hp (129kW), 591lbf (801Nm) and a 69 gal/min (264 l/min) hydraulic circulation, it’ll perform to the max throughout. It’s all-day comfortable – a comfy operator is, after all, a productive one. It’s also safe, serviceable and, with features like Eco mode and Auto Idle, it’s highly fuel-efficient too. • We use state-of-the-art manufacturing processes like robot machining, precision paint technology and innovative assembly techniques to guarantee the very highest levels of quality for the JCB 437. • The articulation joint on a JCB 437 has a heavy-duty box section – stronger than a single plate with boss. For added protection, the 437’s steering rams are high up, and its hoses are routed neatly through the articulation joint. • There’s a heavy-duty center pin and oversized bush on the JCB 437’s articulation joint for even more durability, as well as twin taper roller bearings that can tolerate both vertical and horizontal loadings. • The rear counterweight and cast quarter pillars protect the 437’s cooling pack and the back end of the machine from damage. • The JCB 437’s T4i compliant Cummins QSB 408 in3 engine produces its power and torque – 173hp (129kW) and 591lbf (801Nm) respectively – at low revs for excellent response and optimum efficiency. For easier maintenance, this engine doesn’t require DPF aftertreatment. • A variable geometry turbocharger means the 437 enjoys increased performance at low engine speed for improved cycle times and tractive effort. • Compatible with a raft of aftermarket attachments, JCB’s optional quickhitch makes changeovers swift and efficient. There’s also an extensive range of axle options so you can tailor a JCB 437 to any application. • Powerful twin variable displacement piston pump hydraulics help the 437 to circulate a massive 70 gal/min for fast cycle times and excellent multifunction capability. • JCB’s innovative electronic management can perform progressive clutch cut-off for efficient, productive loader control. The 5-speed transmission option with torque convertor lock-up, meanwhile, provides better acceleration, hill climbing and roading performance. • The optional torque lock-up 5-speed transmission means the JCB 437 can achieve 100% efficiency through the transmission in 2nd to 5th gears for improved performance and fuel consumption. Closer gear ratios mean lower engine speeds in each gear. • The JCB 437’s Automatic Idle feature returns the engine to 700rpm after 30 seconds of inactivity, while Eco mode limits engine speed to 1800rpm for reduced fuel consumption. Either way, productivity remains formidable. • Wheel speed braking means the 437’s brakes rotate at the same speed as the wheels for heat and drag reduction, as well as improved fuel economy. • JCB’s engine idle shutdown facility can safely apply the brakes and switch the 437 off after a programmable amount of time. • The JCB 437’s hydraulic cooling fan automatically reacts to ambient temperature and adjusts the fan speed to optimise cooling, reduce fuel consumption and lower noise levels. • A tilting and telescopic steering column on the JCB 437, plus a comprehensive range of loader controls (multi-lever, joystick, or joystick with proportional auxiliary) means the 437 operator is always comfortable to operate – and therefore productive. • There’s a stylish, modern central dash display which provides machine health details, service requirements, operating information and more. • The 437 has air conditioning and automatic climate control options to create perfect working temperatures– as well as a range of seat options. • JCB Smoothride load suspension limits shock loadings on the 437, and therefore reduces material spillage and structural stress, as well as increasing operator comfort. • The optional rear-view camera displays an unobstructed rear view on the JCB 437’s in-cab color monitor. • Inclined, equally spaced access steps, together with well-positioned grab handles, make for safe access to a JCB 437. • The JCB 437 has superb all-round visibility, courtesy of interior mirrors, heated exterior mirrors and bonnet mirrors. • Non-slip walkways and additional grab handle options make operators safe climbing onto the JCB 437. • The JCB 437 cab is isolator-mounted, compliant with ROPS/FOPS standards, and positively pressurised against dust. You can choose from fresh air, carbon and P3 – HEPA recirculation filters as well. • Gain easy access to the JCB 437’s engine bay and large single-faced cooling pack with wide-opening gullwing doors. Daily checks and grease points can be accessed from ground level. 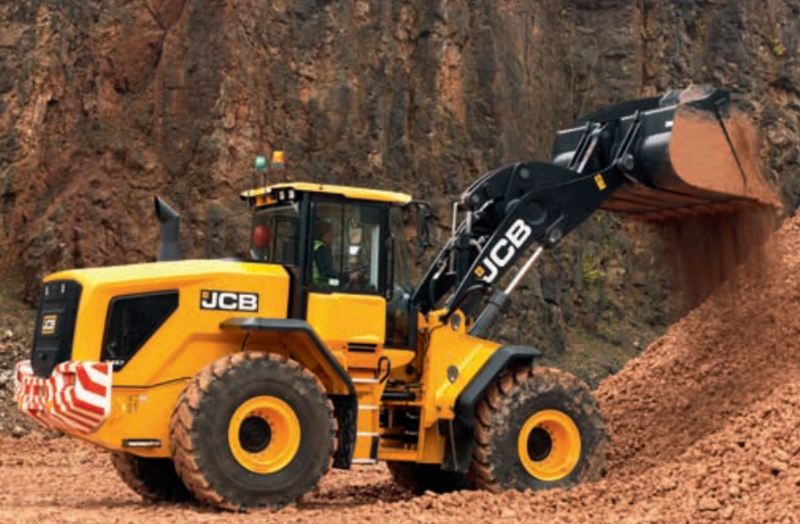 • Because it uses premium components like a Cummins engine, ZF transmissions and axles, Rexroth pumps, and Parker valve blocks, the JCB 437 has a long service life built in. • Full hydraulic dual circuit braking with multiple oil-immersed disks gives the 437’s braking system a virtually maintenance-free lifespan. • Group test ports mean you can check the braking, steering and hydraulic system pressures easily on a JCB 437. The all-new JCB 457 gives you, epic style, visibility, power, speed, strength, efficiency and quality. Featuring a powerful new MTU diesel engine that meets Tier 4 final emissions without the need for a costly and in-efficient DPF. 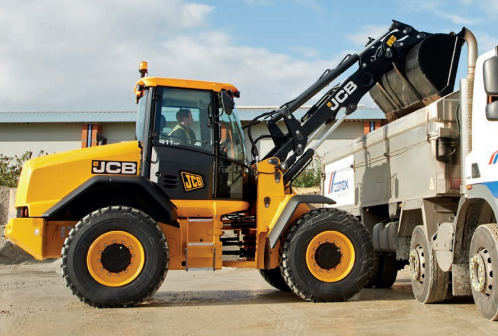 New JCB CommandPlus cab provides the ultimate in operator comfort and productivity. Unrivalled visibility, command driving position and seat mounted controls keep you in total command. Innovative design provides easier ground level service access with a one piece automatic opening bonnet. Tailored service packages and the best dealer backup complete the picture. 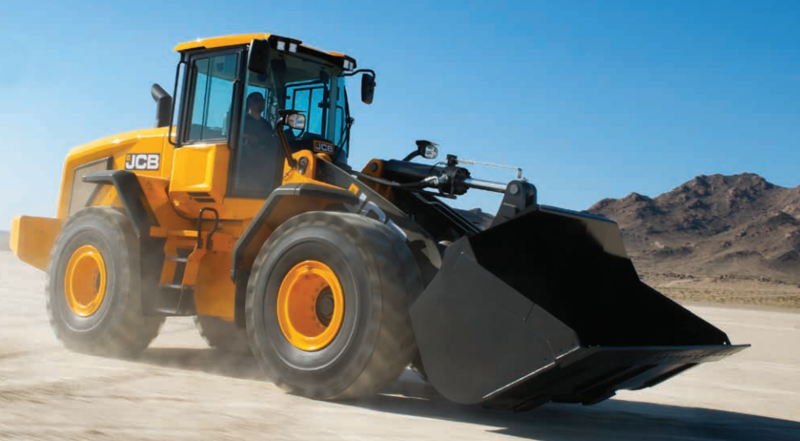 A machine designed and built to be everything you’re looking for in a wheeled loader. • You’ll immediately notice the redesigned ROPS structure on the new JCB 457; this has allowed the A pillars to be moved to the same width as the rear of the cab, providing a larger interior with a panoramic front windscreen. • There are two full colour LCD screens to navigate your 457’s operating menus, with one doubling as a monitor for the rear view camera. Using this simple, dedicated menu interface is easily done with an intuitive optional rotary controller. • After extensive research into operator ergonomics, we’ve devised the Command Driving Position specifically for the 457 wheeled loading shovel, which boasts the very optimal control layout for a multitude of different driver shapes and sizes. • The new JCB 457 wheel loader’s MTU engine offers you plenty of low-end torque and maintains it over a wide power band. By using lightweight materials in the construction of the machine, you can also expect an excellent power-to-weight ratio. • A hydraulic cooling fan automatically reacts to ambient temperature and adjusts your wheeled loading shovel’s fan speed to optimise cooling and reduce fuel consumption. This also lowers noise on your site. 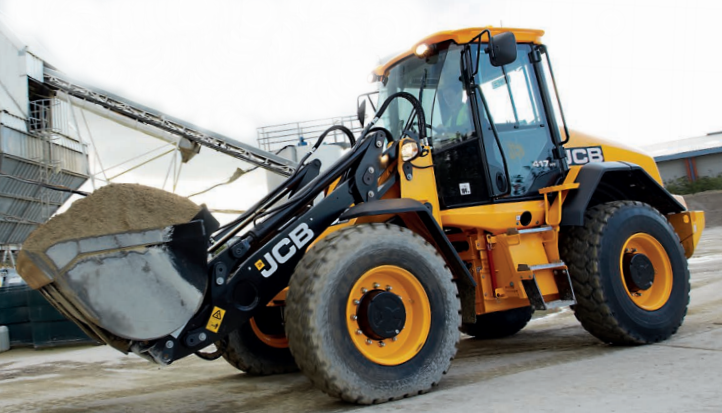 • Wheel speed braking means the brakes on the new JCB 457 front loader rotate at the same speed as the wheels for heat and drag reduction, as well as improved fuel economy. • If you plan to use your new JCB 457 wheel loader for quarry work, choose the dedicated quarry safety pack, which includes blue flashing reverse lights, a green operator presence beacon, a rear object detection system, and hi-viz exterior chevrons. • On the new JCB 457, you’ll find the rear-view mirrors mounted in front of the A-pillars for improved visibility. Interior mirrors, heated exterior mirrors and bonnet mirrors combine to offer excellent views to every corner of your wheeled loading shovel. • The new front fender flaps have been carefully designed and honed to keep forward spray to a minimum. This increases safety and decreases debris build-up on your wheeled loading shovel. • The new 457’s cab is isolator-mounted, compliant with ROPS/FOPS standards, and positively pressurised against dust. You can choose from fresh air, carbon and P3 – HEPA recirculation filters as well. • It’s easy to get to the engine on a new JCB 457 with a large automatic opening single-piece bonnet. Accessing the diesel and DEF tanks is similarly straightforward via the lockable grille at the rear of the machine. • Most Tier 4 final engines use a costly Diesel Particulate Filter (DPF) that can require replacement at the expense of both money and time. The MTU engine in the new JCB 457 is DPF-free, thus reducing your servicing and running costs. 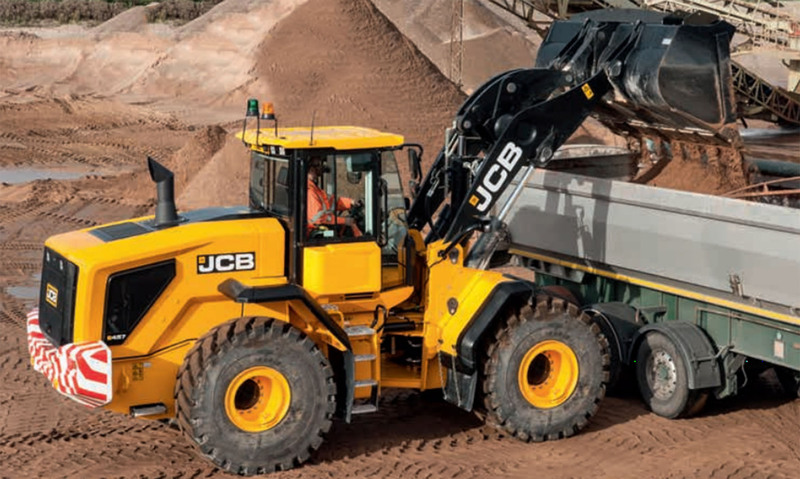 • By using exclusively premium components (MTU engine, ZF transmissions and axles, Rexroth pumps and Parker valve blocks) on the new JCB 457 wheel loader, we’ve built in long service life as standard. • The MTU 6R1000 470in3 engine fitted to the new JCB 457 produces 193kW (258hp) of power and 848 lbft of torque (6% more than our outgoing model). What’s more, it produces all of this at low revs for incredibly responsive operation. 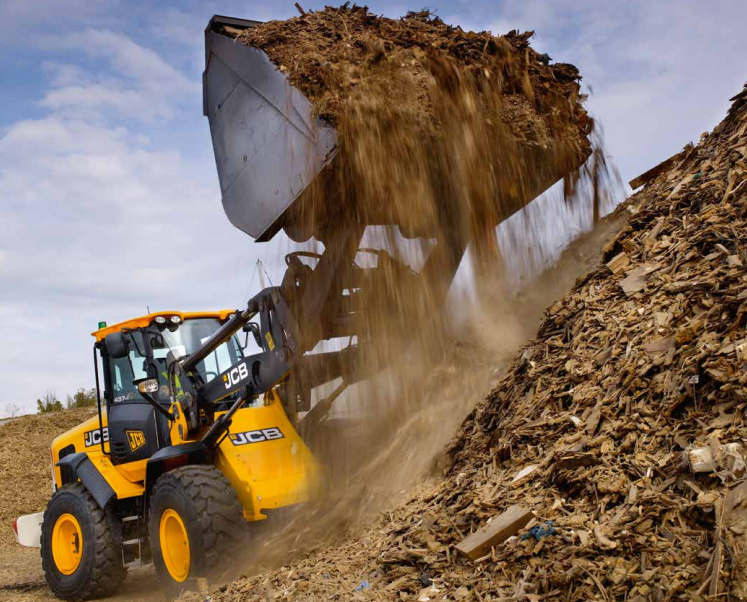 • There’s no need to worry about wasting time and money replacing a diesel particulate filter (DPF) on your wheel loader; its MTU engine requires only exhaust gas recirculation (EGR) and system selective catalytic reduction (DOC). This also improves fuel economy. • Powerful twin variable displacement piston pump hydraulics can circulate a massive 70 gal/min for fast cycle times and excellent multifunctioning capability. 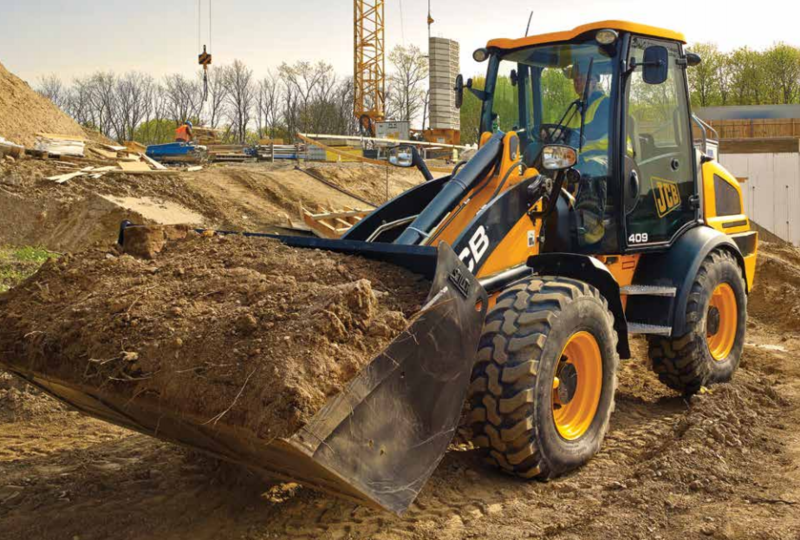 With maximum breakout forces of 38,667lbf, this wheel loader has the power to carry out extremely arduous loading jobs. • Specify your perfect loader arm: Z-bar linkage (ZX) for high breakout applications or high torque (HT) for parallel lifting and multi attachment work. High lift and super high lift options equip your 457 for applications involving high loading heights. • This wheeled loading shovel’s innovative electronic management system can perform progressive clutch cut-off for efficient, productive loader control. This feature controls tractive effort via the transmission, diverting maximum power to the loader hydraulics and reducing service brake wear and fuel consumption. • You can choose from three axle options on the new JCB 457 wheel loader: open differentials for hard standing; limited slip differentials for soft, muddy terrain; or open differentials with an automatic locking front diff for varied conditions. • All JCB wheel loaders including the new 457 benefit from finite element analysis and rig testing of up to 1 million cycles to ensure superior strength and durability. Cold cell testing guarantees starting performance down to -4°F. • High tolerances and accurate location of pins and bushes are assured with JCB’s precision machining techniques. State-of-the-art manufacturing processes like robot machining, precision paint technology and innovative assembly techniques help to achieve the very highest levels of build quality. • The new MTU engine has all the grunt you need for day-to-day loader operation, together with a rugged construction that can cope with sudden, hard load changes when switching between tasks. • This wheel loading shovel’s articulation joint has a heavy-duty box section, a heavy-duty centre pin and oversized bush, as well as twin taper roller bearings on the bottom box joints. This setup can easily tolerate both vertical and horizontal loadings. • A solid cast rear counterweight protects your JCB 457 wheel loader’s back end – including the rear lights and cooling pack – from damage. Hoses are neatly routed and clamped through the articulation joint, well away from any pinch points. • You can specify your wheeled loading shovel for heavy-duty applications like waste or corrosive material handling.